There are so many over the counter products which are available in the market to treat various types of skin allergies. Nonprescription or over the counter medicines are medicines which you can buy directly from a pharmacy or a health store without any prescription from a doctor. These remedies can be tried before seeking treatment from a doctor especially if the rash is mild to moderate and may not need immediate medical attention. Sometimes you may not get an appointment in a hurry and there may be a waiting period. In that case, it is useful to know about some of the OTC medicines which are available in the market to treat skin allergies. It is best to learn the active ingredients in common products before trying out any OTC product. You have to know your symptoms and severity of the skin allergy before trying out any product. There are so many substances when contacted with skin, can cause an allergic reaction. These substances are called allergens. The allergic reaction which occurs in the skin causes a rash which is usually itchy. It can be mild to severe. 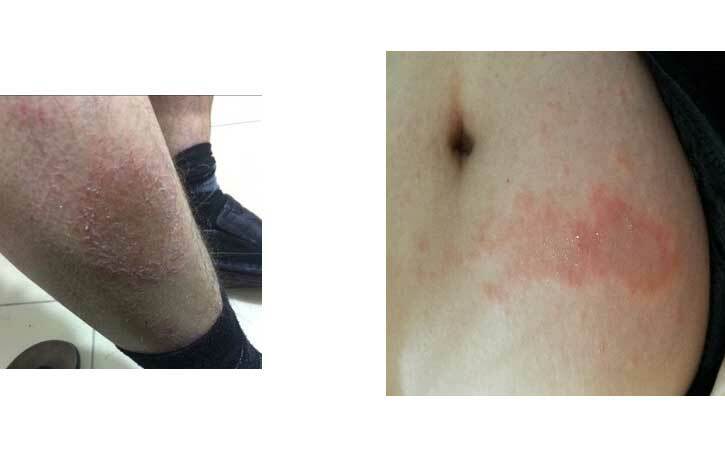 The rash can vary from red spots or just redness to bumps and blisters. Certain plants (Poison Ivy, Poison oak), jewelry, cosmetics, perfumed sprays, strong detergents, nickel (in watch straps), rubber (shoes, slippers, gloves) etc. Treatment – While the best option is to avoid the trigger causing dermatitis, there are creams and ointments to apply on the rash. If mild can apply calamine lotion which soothes the skin – the active ingredients are calamine and zinc oxide which reduces skin irritations and itching. It also protects the skin from infection as it forms a barrier. This relieves pain and itching and soothes skin in mild forms of contact dermatitis. It claims to promote the healing of skin irritations. 1% Hydrocortisone – There are creams and ointments in the market containing this active ingredient which is a mild steroid. It is an anti-itch cream which works by reducing inflammation. Do not over apply or use more than the recommended period. Prolonged application of steroids can lead to thinning of the skin. However, if the rash is itching and irritable and doesn’t respond only to local applications, there are oral antihistamines which are available as over the counter products. However, these can be used for adults and children above 12 years of age. Fexofenadine 180mg tablets – It is an oral antihistamine which can be taken 1 tablet a day as it acts for 24 hours. It doesn’t make a person drowsy. Loratadine 10mg tablets – for 24-hour relief of itching and other allergic symptoms. Better to seek treatment from a doctor as OTC medicines can react with the prescription medicines which you may be already taking or cause unnecessary side effects. When you take OTC medicines you are responsible for it. There may be side effects or adverse effects which can be harmful. So be cautious whenever trying an OTC product. If the rash is infected due to scratching there are certain antibiotic creams which are available. Due to the antibiotic policies, these creams are limited as over the counter products. Antibiotic Neomycin and zinc-containing ointment (Neosporin) is a good product for contact dermatitis rash which is infected. If the rash is mild oral antihistamine can be taken for itching. Hydrocortisone cream can be applied on the rash twice a day. However, if the rash is severe and widespread the person should seek help immediately. 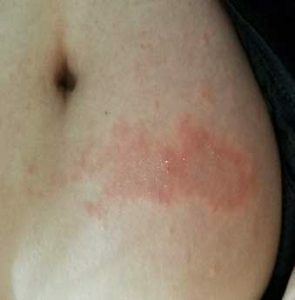 This is a common skin condition which gives a red itchy rash. It can be associated with hay fever or bronchial asthma and can run in families. 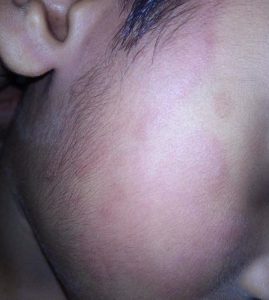 It is a chronic rash which can occur periodically. Certain allergens trigger exacerbation of eczema. Dry skin is commonly associated with atopic dermatitis/ eczema. For managing dry skin use a skin product which is rich with emollients daily maybe 2 to 3 times a day to lock in the moisture. Emollients are best used after a bath while the skin is still damp. As it holds the water and moisture. Use products which are preservative free and fragrance-free as they are less irritable to skin. The active ingredients in good moisturizing products are Petrolatum, glycerin, Lanolin alcohol, panthenol, petroleum jelly, aqueous cream etc. Buy a product which has 1 or more of the above ingredients to treat dry skin associated with eczema/ atopic dermatitis. Vanicream – apply over affected area 3 -4 times a day, after cleaning the area with warm water and a mild cleanser and patting the area dry. Mild steroid like 1% hydrocortisone cream can be applied topically to reduce inflammation. Itching can be controlled with oral antihistamines like chlorpheniramine, loratadine, fexofenadine or cetirizine. However, caution should be taken in dosage and frequency of administration. 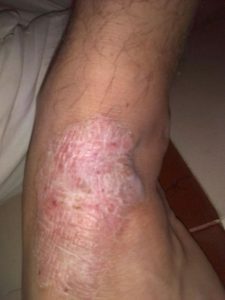 If eczema looks infected antibiotic cream Neosporin can be applied, which is one of the few OTC antibiotic creams. These allergens can get into the body from the air through the nose, ingestion from mouth and contact with skin. Treatment options – If you know what caused the allergic reaction the best method is to avoid the trigger. OTC oral Antihistamine such as chlorpheniramine, loratadine, fexofenadine or cetirizine. Should take the correct dose incorrect frequency. Usually hives rash lasts a short duration. If it lasts longer that means the person is still in contact with the trigger substance by either oral, nasal or skin routes. 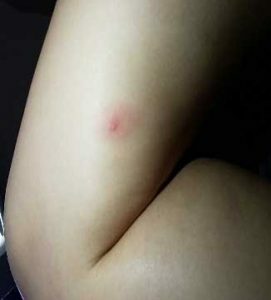 There are OTC Insect bite relief sticks to reduce pain and itching (containing Benzocaine) and some antiseptic properties (containing phenol) which prevent infection. Itching can be reduced by oral antihistamines like loratadine, chlorpheniramine, cetirizine or fexofenadine. Hydrocortisone cream can be applied to the red spots to reduce inflammation. If you don’t know what causes your rash but there is a general itch only, can try an OTC oral antihistamine. However, if the itch doesn’t reduce with time, the person should be investigated to find the cause of the itch and treated accordingly. When to seek help in skin allergies?